The options on this page only affect connections to FTP servers. Passive FTP: Activates the 'Passive FTP' option for connecting FTP servers. Use this option if your FTP server requires this. Workaround for 1Y-Difference-Problem: When connecting a Unix-FTP-Server it can happen that the file times are displayed exactly one year wrong. (This problem was officially confirmed by Microsoft and is not caused by Easy2Sync: Q284455 http://support.microsoft.com/default.aspx?scid=kb;en-us;Q284455&gssnb=1) This can of course lead to problems in the synchronization. You can avoid this problem by activating this option. 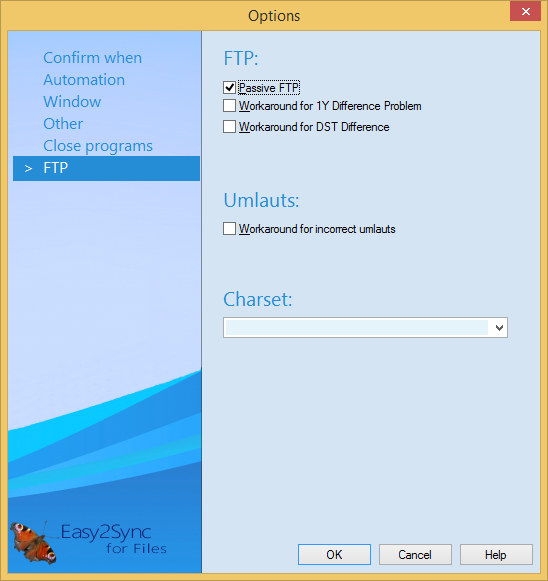 Easy2Sync will then add exactly one year to each file on a ftp server. If you want to configure this on a per-task basis, change the options within the task (last page of the task properties). Workaround for DST Difference: Compensates a 1-hour difference. Workaround for incorrect umlauts: Activate if German umlauts are replace by strange characters. Charset: If you have files with non-ascii characters (e.g. Umlaute, East-European or Asian characters) in their filenames, it can be necessary to enter the right charset here.